Sikkens, backed by unparalleled training and support form AkzoNobel, has helped thousands of shops increase cycle times, reduce re-dos, and decrease material costs. All Sikkens products are designed to make every job as simple as possible, which means there’s less chance for errors and re-dos. Sikkens refinishing systems are formulated to go on easier, in fewer coats and with less dry time so your painters can paint more cars in less time – with less material. 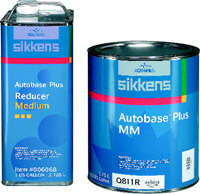 Plus, all Sikkens products – including undercoats, two component single stage urethanes, basecoats and clearcoats – help reduce application time and materials usage while giving you the best looking, most durable finish in the industry. When you choose Sikkens-brand paint, every can comes backed with the know-how that only a company like AkzoNobel can deliver. Colorbuild Plus achieves color without the use of topcoat toners-just mix the six colored primers for the desired primer /sealer color. Colorbuild Plus reduces the amount of topcoat material needed to accomplish hiding translating into decreased cost and shorter application time. Autobase Plus provides the best color match in the industry, plus better coverage, sprayability, and metallic control. Autobase plus is clearly the industry’s leading basecoat-the color you can count on. Autoclear III clearcoat system produces a brilliant finish with a minimum bake time. Using this high solids clearcoat increases your efficiency and productivity. Autobase Plus. Color You Can Count On.